The winter time coughs and colds made its way into our home last week and I had two under-the-weather toddlers. Wanting to avoid going to the doctor, and dosing with medicine, I searched for natural alternatives to treat my twins before it developed into anything serious. While it might sound a bit like potions and spells, these remedies worked liked a charm. I use this rub helps to ease breathing when my littles have a blocked nose. It works like Vicks rub to but without any of the bad stuff. I rub it on my twins’ feet and chests after bath before we put on their pyjamas. Mix the eucalyptus drops into the coconut oil. Use your discretion with the amounts, the coconut oil just acts as the carrier so the eucalyptus must be the dominant smell. Apply using cottonwool ball (if the mixture is liquid), or just your fingers (if the mixture is more solid). This mixture works like a charm in clearing up coughs. It actually doesn’t taste as bad as it sounds! Chop the onions into a jar and add the honey. Place the lid on and leave for a few hours and a liquid forms in the jar. I give my babes a teaspoon of this liquid throughout the day (4-5 times a day) using a dropper (I find it easier to administer than using a teaspoon. I keep the mixture in the jar for about three days (sometimes adding more onion and honey if there is not much liquid left) and then I make a whole new batch. Chop half an onion and place on a side plate near the cot. I do this just after my babies are asleep so the chopped onion is as fresh as possible. Just as onions make you cry when chopping them, the fumes from the onions help clear passageways. Warning: the nursery does tend to smell of onion! Disclaimer: The remedies mentioned in this post are just a mother sharing some tips and are by no means intended to be medical advice. 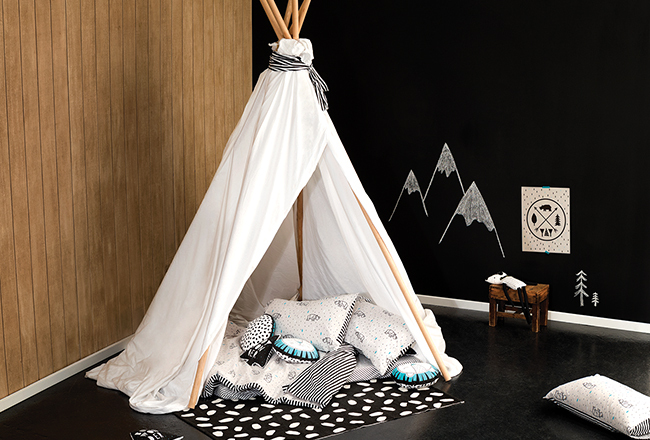 We are so excited with the new Cotton On Kids Home collection which launches in two days time. Don’t say we didn’t warn you when you want to redecorate your kids’ rooms! 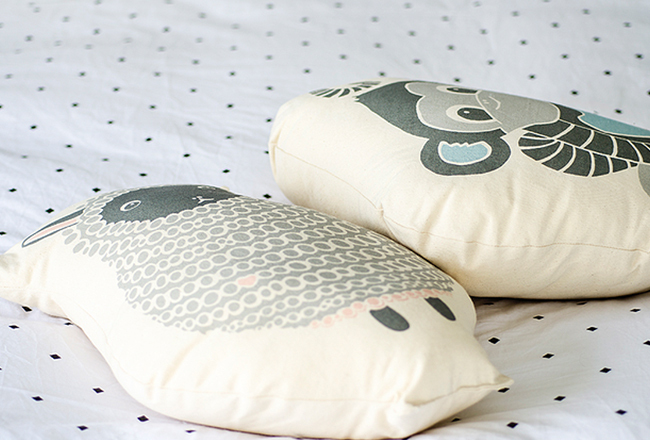 From fun cushions – how great is that blue lion one? – to magical bedding – we love the pink and gold combo and the black and white spots. In stores from 1 July. 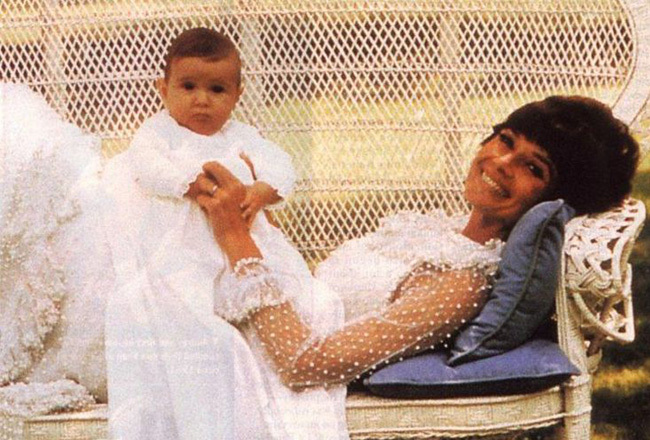 Audrey Hepburn wearing Valentino, photographed with her son Luca by Henry Clarke at the gardens of her famous “La Paisible” in Tolochenaz (Switzerland), in February 1971. A new birth trend that is taking off in Australia. The most hilarious tweets that sum up parenthood – the one about whispering had us laughing out loud. This birth didn’t go according to plan… this mama has a surprise home birth. Can you imagine? Travelling with your babe? Here is Goop’s Paris with Kids Guide and their London with Kids Guide. 8 Confessions of a new dad. 15 amazing pics of mamas breastfeeding. 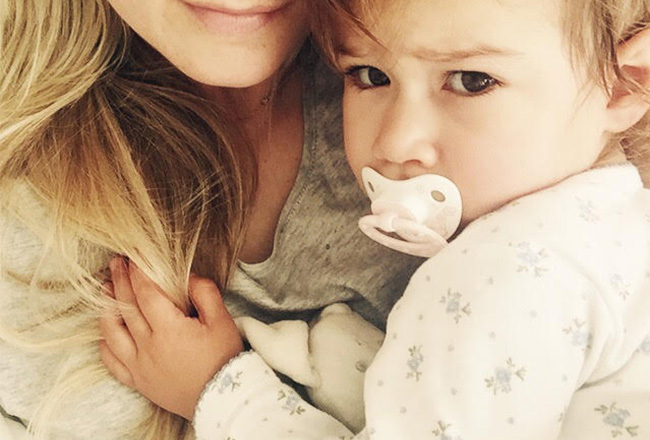 As Francie Sugar turns 3 months, Cheska reflects on being a mama. Remember to enter our Naartjie competition – you stand the chance to win a R500 shopping voucher. Crib sheets that we love. 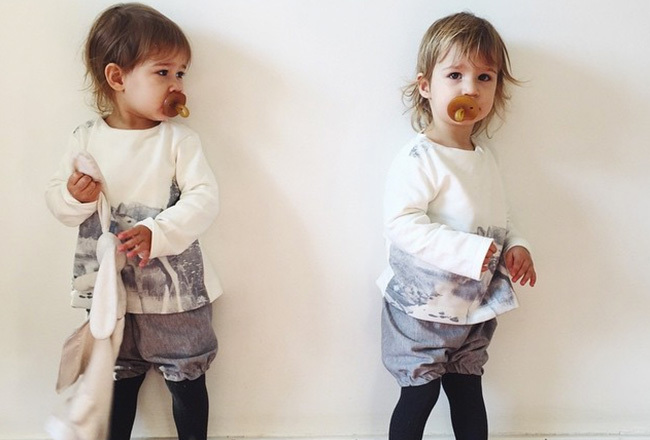 See more of What the Twins Wore on their Instagram account. Francie Sugar is 3 months old today, which means that I have been a mother for the same amount of time. 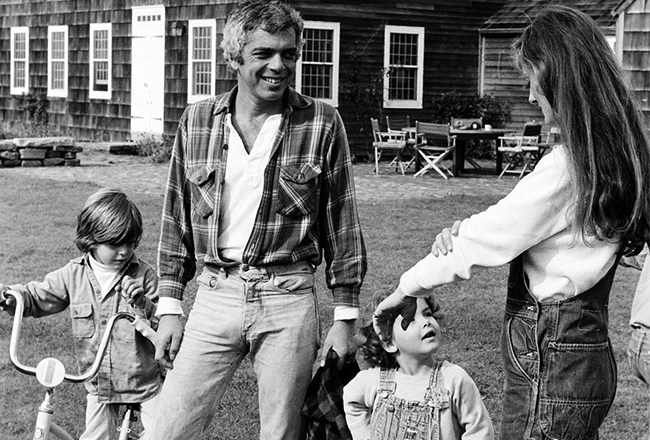 All the mothers in my life – my mama, both my sisters and even friends, warned me that motherhood is the most wonderful, heartbreaking experience. I know now what they mean – each day that passes is a momentous occasion of surviving and yes heartbreaking because the day is over and your tiny baby is one day older. I understand now why, even though I am 29 years old, my mother still calls me her baby. Only mothers understand the achievement of a sleeping baby, of self-soothing, of a good feed and even that poo. Only mothers understand the guilt of an endless cry or the heartbreak when someone tells you that your baby is getting ‘big’. Only mothers understand the conflict between co-sleeping cuddles and independent cot time. Only mothers understand the soft satisfaction of a suckling baby at the end of the day and only mothers could ever understand the beauty and calmness of midnight feeds. 3 months of Francie Sugar has been magical – that is the only way to describe it. 3 months of being a mother have been pretty magical too, I cannot imagine being anyone else. To celebrate the last trimester, as some call it, here are some snaps that the lovely Robyn Davie snapped of us when Francie Sugar was just 8 weeks. 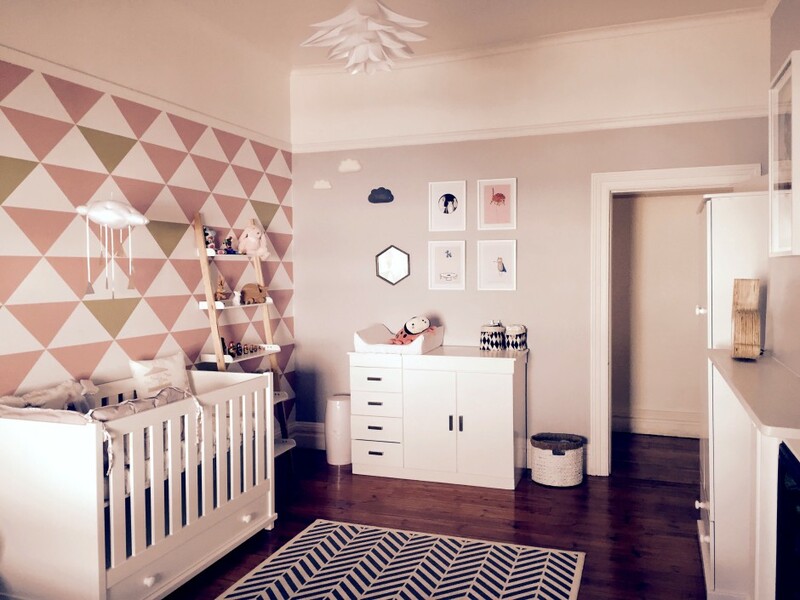 Candice, the babe’s mama, said that from the start that she wanted a modern, neutral nursery that was not too girly. “I spent endless hours browsing the internet gathering ideas which gave me inspiration for a room that was pretty and fun, with some cute touches, a room that she will be able to grow into.” We love all the unique elements in this nursery, many designed by friend’s of Candice and sourced from local creatives, that work together to create the perfect space for a baby girl. We love it when we discover a new South African brand for our babes and this one looks particularly cool. 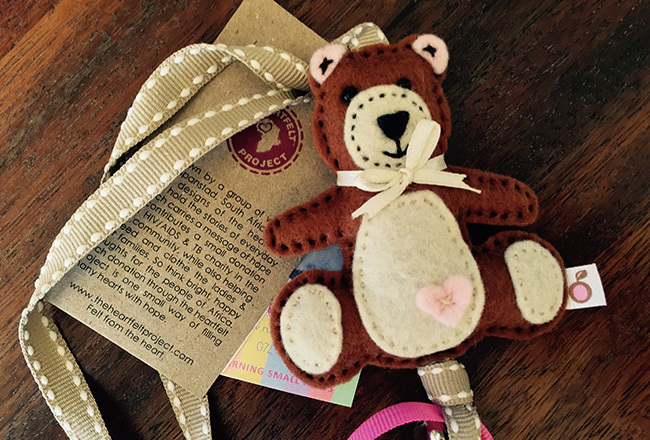 Aapie & Skaapie is a Cape Town based brand, making the cutest handmade products. They have three characters: Aapie, Skaapie and Giraffe and their bed sheets look super cool too. Follow them on Facebook for their latest offerings. Happy weekend lovely mamas. What are you up to? We are excited to celebrate our first Father’s Day on Sunday – we’re hoping for a lazy morning, extra warm cuddles and a delightful walk for breakfast. 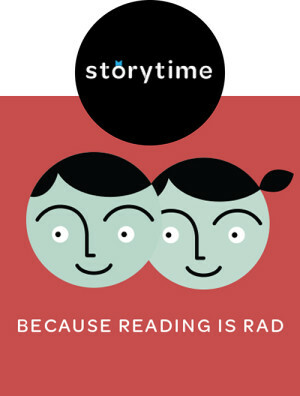 We are all then off to a big Sunday lunch – just the way we like it. 13 phrases to calm an anxious child. Curious about co-sleeping? You must read this. A child explains why he is a vegetarian – pretty much the cutest thing. Father’s Day on Sunday here is our gift guide. Don’t forget to enter our Naartjie competition – stand a chance to win a R500 shopping voucher. 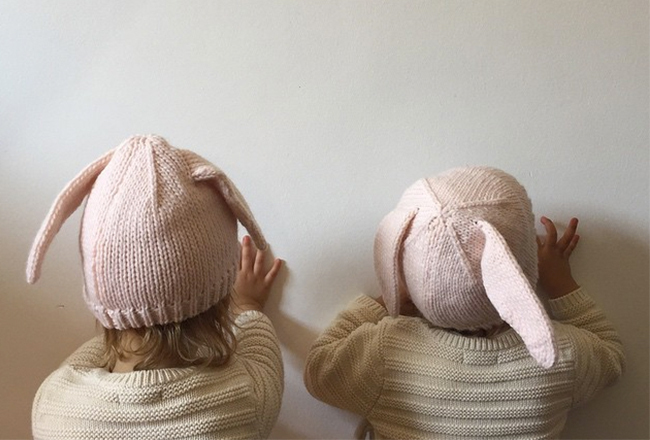 My little pink bunnies. Hats and cardigans from Gap. Corduroy rompers with a bow Made by Kimmy, black tights and our favourite winter shoes from Country Road at Woolworths. This icy cold morning was the perfect excuse to get bundled up in our snug grey jackets from Country Road at Woolworths – we added a knitted grey scarf and beanie too.